Integrins are heterodimeric transmembrane receptors that mediate adhesion between the cell and the ECM and regulate such diverse activities such as cell adhesion, proliferation, migration and ECM organization during normal development and are implicated in pathological processes such is wounding, inflammation and metastatic cancers. While each of the cellular and pathological processes is complicated, the availability of integrin KO’s as well as blocking peptides and antibodies have allowed for detailed analysis of the role of integrins in these processes and led to new therapeutic insights. Of particular relevance is a strong inflammatory and wound response that is elicited in the integrin KO mice which offers and excellent model system to address the nexus between tissue organization and signals mediating an immune response that may be involved in the process of scar less wound healing. 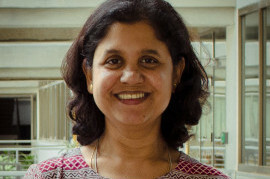 The primary interest of the Raghavan lab is to elucidate how integrins and their associated proteins maintain epithelial homeostasis both in development and in disease states. In collaboration with the lab of Dr. Ramanuj Dasgupta, we investigate the function of microRNAs in the regulation of epidermal stem cell self-renewal and differentiation, and their interactions with the stem cell niche, with a particular focus on factors that regulate the ECM.